Galcomm Review 2019: Is Galcomm a Good Hosting? Galcomm was established in 2000 as an internet services provider. The hosting vendor prides itself on being the largest registrar in Israel with accreditation from the Israel Internet Association and ICANN. Founded in 2000, Galcomm specializes in providing web hosting solutions to small and medium business enterprises. In addition to web hosting, the vendor offers a wide range of internet services including email hosting, web development, Google advertising, and SEO among others. The firm boasts of a client base of at least 250,000 in Israel and other countries worldwide. Its website is available in Hebrew and English. Galcomm’s servers are hosted in data centers in Israel. The firm’s web hosting solutions support both Linux and Windows operating systems. This hosting provider offers three Linux shared hosting packages and three Windows shared hosting packages. The Windows shared package comes with the following plans: Mini on Windows Server, Storage Abroad, and Windows Writer. The Mini on Windows Server is the most basic package and comes with 100MB storage space, 3GB monthly bandwidth, and three mailboxes. The Linux shared hosting solution includes the following plans: Mini on Linux server, Extra Linux, and Operation WordPress Site. Mini on Linux server, the basic Linux shared package includes 100MB storage space, 5GB monthly bandwidth, and three mailboxes. All of the vendor’s hosting packages come with full daily backups and robust firewall protection, as well as antivirus and antispam. 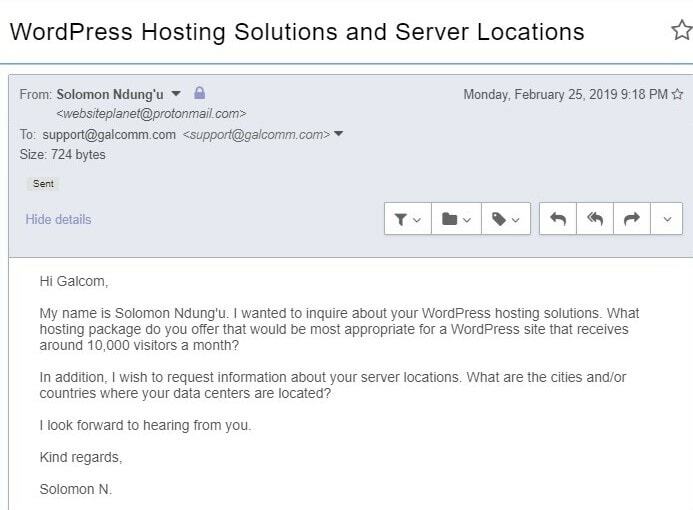 Galcomm also creates customized solutions for business enterprises with specific hosting needs. Apart from web hosting, the hosting provider also offers domain registration services, and SSL certificates as an additional package to its hosting solutions. Galcomm’s web hosting solutions are reasonably priced. The vendor offers flexible monthly billing cycles and its prices are listed New Israeli shekel. It does not have a money-back guarantee but offers a 99.9% network uptime guarantee. You can get in touch with Galcomm’s support team via telephone, email, and ticketing system. The vendor has no live chat support. The vendor’s support team is available 24/7. That said, my email to this vendor received no response. The Galcomm website has no knowledge base either. Though this vendor has been in the hosting business for over 19 years, it has put significant investment into growing its hosting infrastructure and expertise to handle large websites with complex databases. While its solutions might satisfy SMEs, large and fast-growing enterprises might feel limited by its offerings. Wondering how Galcomm stacks up against other Web Hosting companies? Enter any other Web Hosting company and we will give you a side-by-side comparison.